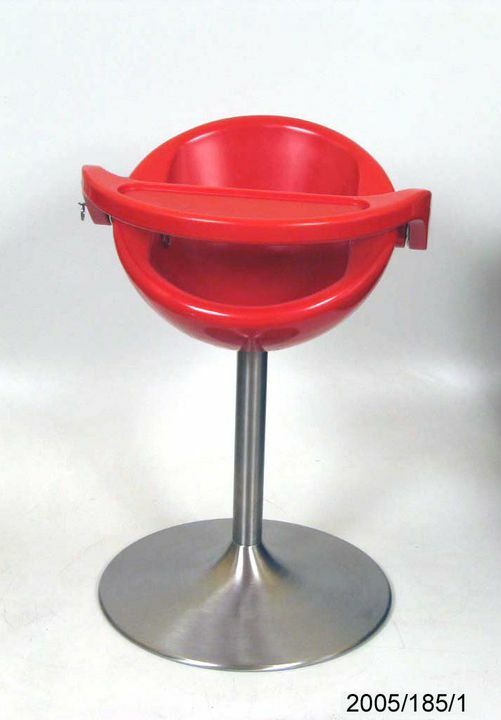 The ‘Nest’ high chair was originally designed in 2002 and shown at DesignEX in Melbourne and 100% Design in London the same year. ‘Nest’s’ stylish ‘sixties’ look, practicality and stringent safety features made it an immediate success in the market. It subsequently won an Australian Design Awards ‘DesignMark’ as well as the Design Institute of Australia’s Furniture Design Award in 2003. The chair is now manufactured in the United Kingdom with a worldwide distribution. The chair has a rotation-moulded orange polyethylene scooped-out half shell seat with detachable tray supported on a column and circular pedestal base of powder-coated steel. One prototype is of the whole chair. It is a later modified version in white polyethylene with tray attachment points on top of the shell edges rather than at the sides of the shell. There are three prototype trays for final version of the chair. There are three prototype tray pieces, one of white plastic, one of blue foam core and one of white polyethylene and metal which was the final version of the tray. The original 'Nest' and prototype shell (orange) made by Bug Design (Beautiful Useful Green), Sydney; the final prototype version made by Mozzee Design, United Kingdom. The seat shell and tray made using rotation moulding technology. The column and tray of each chair is removable allowing the chair to be lowered for use by an older child. It has a scooped-out, easy-to-clean plastic seat and detachable tray for babies and toddlers. The chair can be converted to an all-purpose low chair for older children by removing the tray and the metal column that supports the seat. After production of the first 'Nest' in 2002 the design of the chair went through a modification process to improve its look and function. Modifications included a change to the shape of the seat shell and rounding of its edges and changes to the attachment mechanism and location points of the detachable tray. Sally Dominguez is a Sydney architect. After the birth of her first child she established Bug Design with friend Susan Burns in 2001 to design products for babies and young children.